As a collector of nearly all things related to the American Bank Note Company I'm always finding interesting items that I know very little about. Many years back I picked up an ABNC piece about 5" x 8" printed on card stock. It was in a bin of other century-old ephemera priced at a few bucks each. 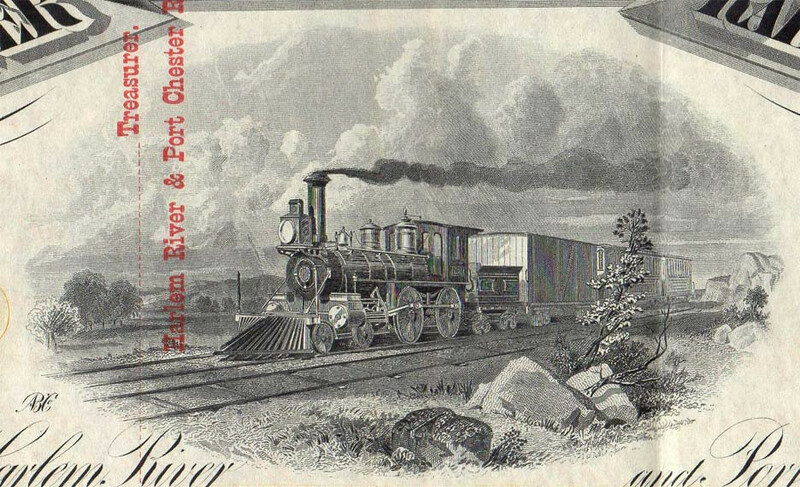 I especially liked the locomotive engraving. Not thinking too much about it, I tucked it away with some other curiosities. A few years ago I pulled it out again and decided to figure out what it was. The back side was an advert for American Bank Note. A quick Google search for the "Manual of Railroads of the United States" brought up a number of results. 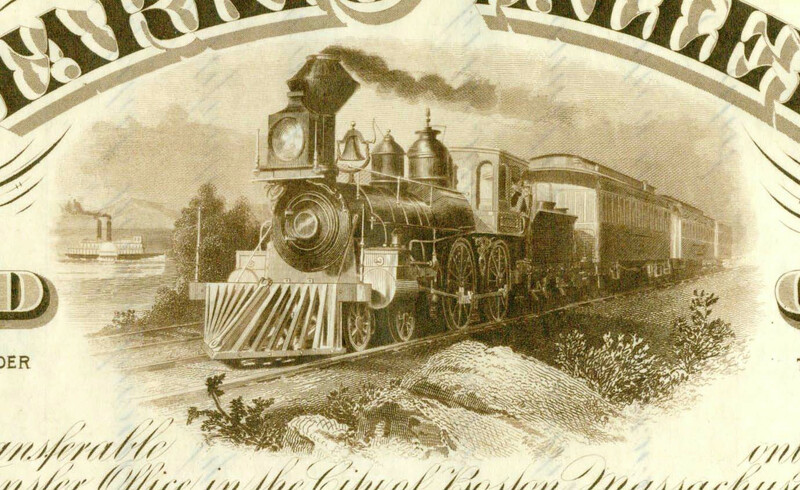 From there I went to the Internet Archive and learned about the "Poor's Manual of Railroads," which was published from the 1870s into the 1940s. This eventually became Standard & Poor's. 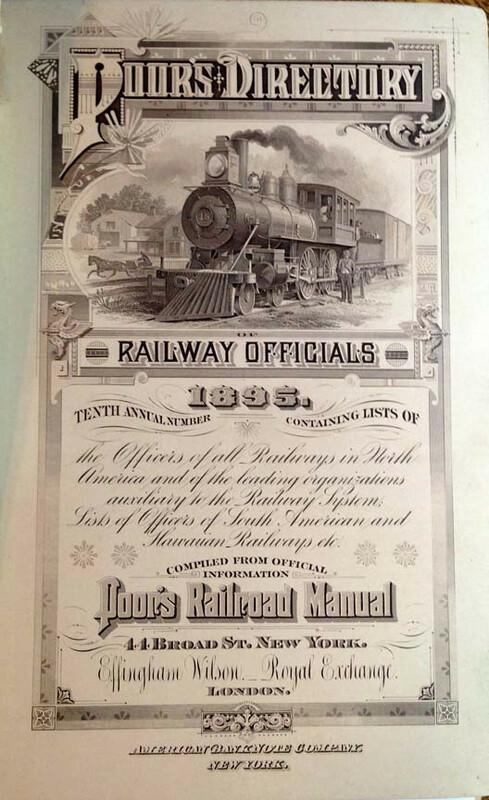 These manuals are 3 to 5 inches thick and chock full of financial statistics on every U.S. railroad, along with maps. From 1873 through 1917, the books all had engraved frontispieces. I made a project of scouting down all the different varieties -- there are eight of them, plus a couple bonuses. The first was engraved by Continental Bank Note Co. 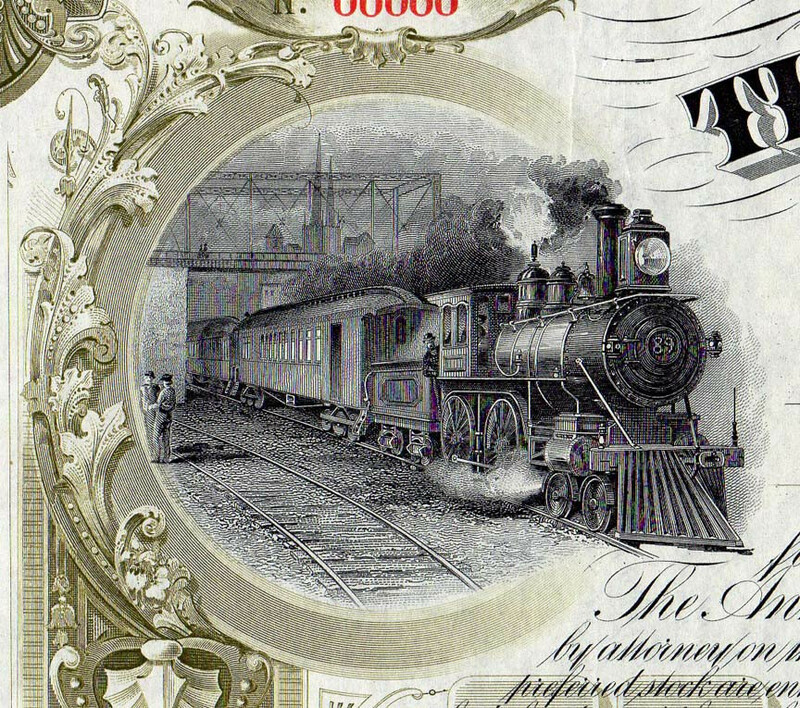 The next two were by Franklin Bank Note, and in 1884 American Bank Note stepped in and produced the frontispieces from then on. 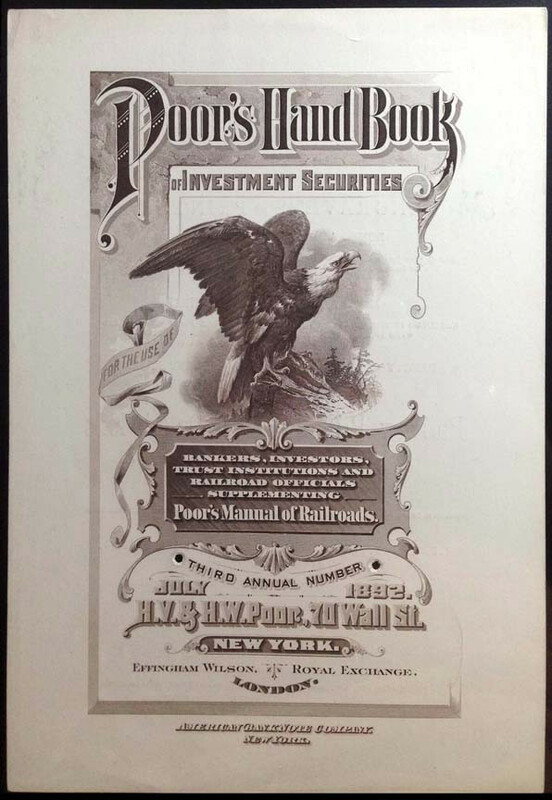 This was a brilliant sales tool -- all the railroad financiers bought these manuals to assess market values, and these were the same people who ordered stocks and bonds to be printed. What better place to show off a bank note company's abilities? In fact, several of the locomotive vignettes also show up on railroad stocks from the same era. After 1917, Poor's decided to stop using frontispieces, or perhaps ABNC decided the cost was no longer worth it. There are a couple other ABNC frontispieces from similar publications. "Poor's Directory of Railway Officials" was published from 1886 through 1895. It stuck with one style of frontispiece, changing only the date. Thats some cool stuff I got into trains but never much the paper side of things. Very cool train vignettes. Some of them look like Baldwins made in Philly from 1830-1956. Here’s a couple of links. Thanks. 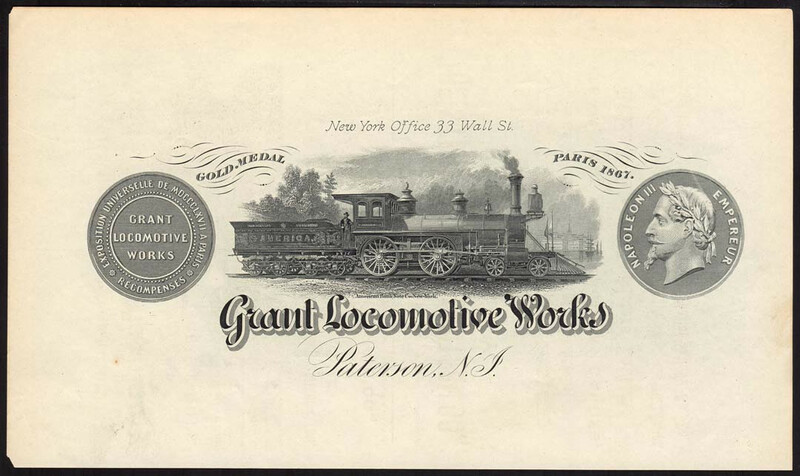 Grant Locomotive Works included an engraved ad in a few of the Poor's Manuals (actually this was just their letterhead). 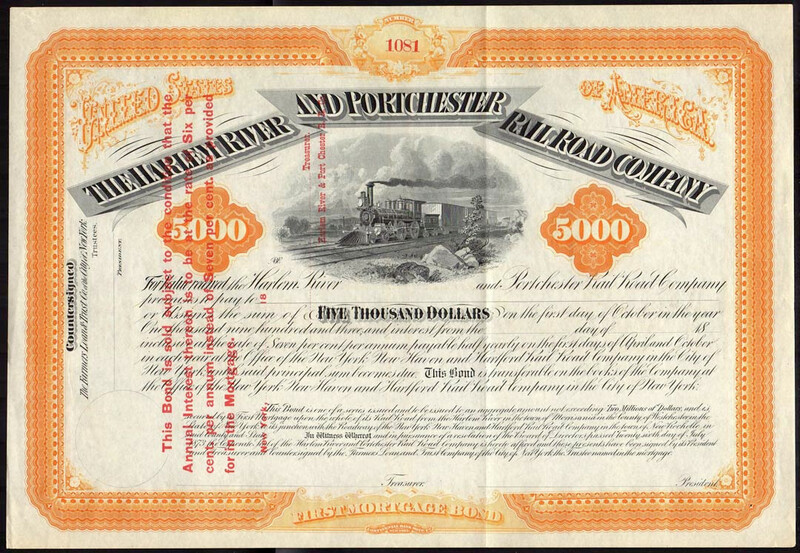 I picked up a nice looking bond today from The Harlem River and Portchester Railroad with a familiar looking vignette. I finally realized I'd seen it on the first Poor's frontispiece. 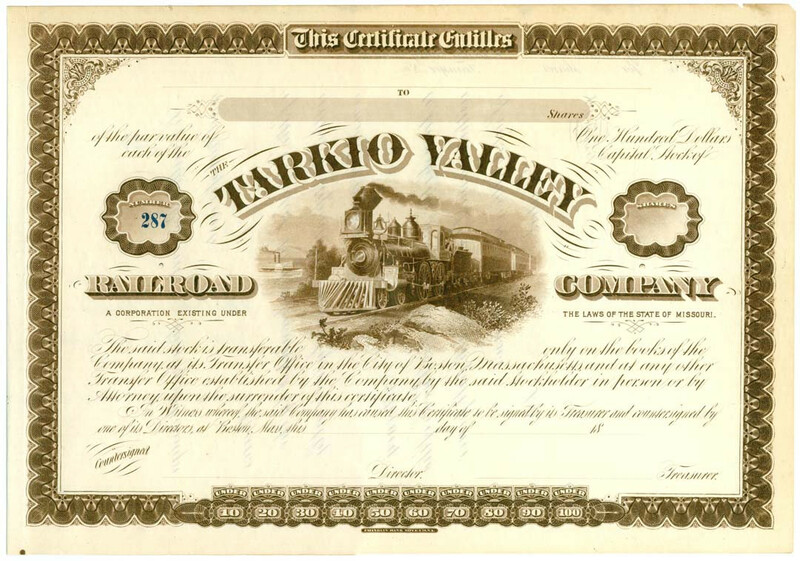 It was engraved by Continental Bank Note Co. in the early 1870s. Very cool thread... Love the railroad images.